Emojipedia is a useful site for discovering what each emoji means and keeping up with the latest in emoji developments and resources. Students can also type in what they want to express and find recommended emojis. Duolingo offers a free course for anyone to learn emoji in 5 minutes. Get students to create their own emoji word problems then see if their peers can translate and solve them. Solve Emoji has several emoji math puzzles for students to solve. Bill Nye has 6 YouTube videos where he explains science with emojis. Topics include the science behind superheroes and holograms. Students can learn the periodic table of elements by representing each element with an emoji and explaining the connection. See this example created by a scientist. Use emoji writing prompts. Show students 3 to 5 different emojis and have them create a story or poem based on these emojis. See my example here. Eric Curts has created an emoji prompt generator to help out with this activity here. Byrdseed is a free web online emoji prompt generator. Students can use image editing apps, like Snapchat or Twitter, to snap pictures of their readings and annotate them with emojis. For example, students can add a next to one of the author’s ideas they like, a to symbolize disagreement, or any of these emojis, , to highlight words or areas of the text they don’t understand. This post explains how I get students to annotate their readings and shows examples. Edji is a great annotation tool allows students to highlight and comment on readings with written text or emojis. Assess student understanding with emojis. Here are a ton of emoji exit ticket examples. You can also download and use this example. Teachers can provide feedback with emojis. Showbie is a learning management system where students can submit work and teachers can provide feedback in a variety of ways, including with emojis. Students can provide feedback to peer work using emojis. Build vocabulary with emoji flash cards! Students can create flashcards using emojis to define the words. Students can also translate part of their readings into emoji. Emojidick and the OMG Shakespeare series are examples of literature translated into emoji. Emoji predictions- List 3 key details about any historic person or topic in emoji and students will make guesses about what they are learning based on the emojis. Promote active learning with student devices with Google’s Emoji Scavenger Hunt. Emojis are projected in the real world and students must find them. Emoji Charades is a free iOS app in which students play charades with others. Instead of acting out the topic, they express the topic in emoji for others to guess. Google Chrome has an Emoji Keyboard extension to use for writing emojis on a computer. Emojitranslate.com allows you to copy and paste text and translates it into emoji for you. This is a starting tool, but students will have to add more emojis to the translation. 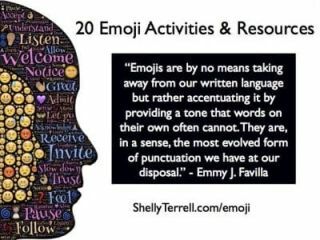 Challenge: Engage students with any of these emoji activities.